This year on May 28, the world commemorates the second Global Menstrual Hygiene Day under the theme “Let’s end the hesitation around menstruation.” The world is being urged to break the silence and talk freely about menstruation as a normal biological process and a key sign of reproductive health. 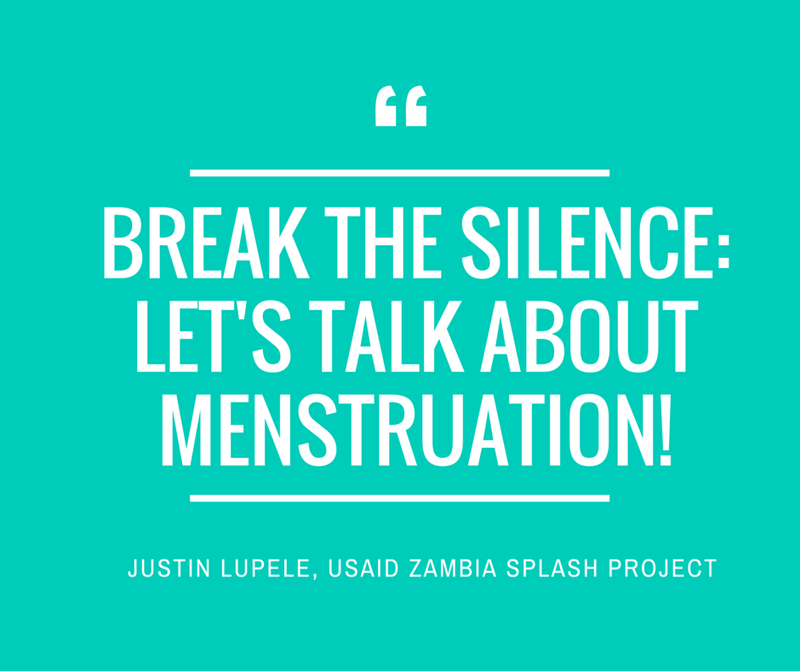 Some cultures in Zambia and elsewhere treat menstruation as something negative, shameful, or dirty. It is shrouded in taboo and secrecy. In addition, girls’ rights to education are being violated through inadequate menstrual hygiene education, insufficient water and sanitation facilities, and poor access to sanitary menstrual materials. Menstrual hygiene facilities and services keep girls in school where they can reach their full potential. Speaking at the inaugural World Menstrual Hygiene Day at Kabulonga Girls Secondary School in Lusaka last year, USAID/Zambia Mission Director Dr. Susan Brems urged Zambians to break the silence, to start the conversation, and follow up with positive action for menstrual hygiene management (MHM). She observed that taboos on the disposal of used menstrual hygiene products and challenges associated with limited access to disposal facilities make it very difficult for girls and young women to participate freely in academic, economic, and social activities. 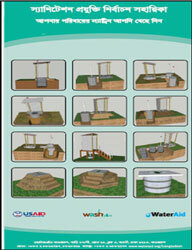 USAID/Zambia has over the last four years invested about US $20 million in Schools Promoting Learning Achievement through Sanitation and Hygiene (SPLASH) to support 616 schools in the Eastern Province through the WASHplus project, implemented by FHI 360, CARE, and Winrock International. SPLASH and the Ministry of Education Science and Vocational Training and Early Education (MESVTEE), in collaboration with other line ministries, provide girl-friendly sanitation facilities and access to menstrual products. In the last four years, SPLASH and the MESVTEE have built 263 toilets and ventilated improved pit latrines with shower stalls for girls’ MHM. 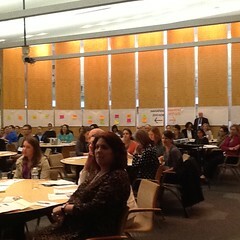 More than 30,000 girls have benefited from these improvements. 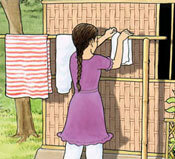 These features make it possible for adolescent girls to bathe and change their sanitary pads at school with privacy. A total of 816 teachers (598 males and 218 females) have been trained as advocates for menstrual hygiene education. The trained teachers share their MHM knowledge with other teachers and members of the community in addition to teaching their pupils. SPLASH has also been working with traditional civic and church leaders to break the silence and taboos associated with MHM. Parents and pupils are talking freely about menstrual hygiene. 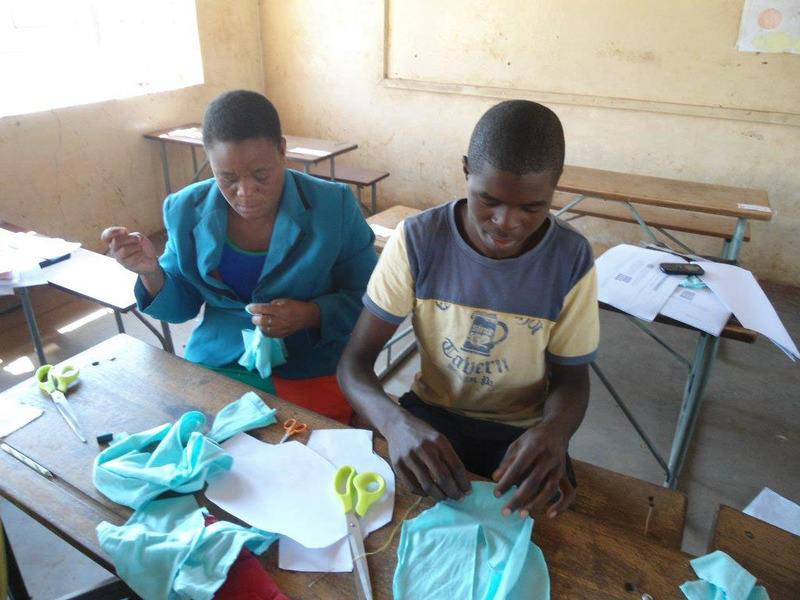 At school, both girls and boys are involved in making menstrual pads. Educating boys and men helps dispel myths, stigmas, and negative perceptions about menstruation. Bringing them into conversations about menstruation helps to create a supportive environment for girls and women. Men and boys are encouraged to participate in pad-making and MHM education to open lines of communication and raise awareness about this once-taboo subject. SPLASH has also forged partnerships with other nongovernmental organizations and private companies to make commercial and local reusable pads. 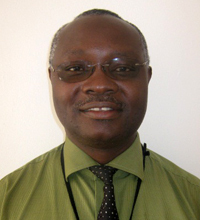 Two of the organizations that have responded to this call are YASH Pharmaceutical Ltd. and Project Luangwa. YASH Pharmaceutical Ltd has produced an eco-friendly washable pad dubbed the pink pad, which is yet to be launched on the Zambian market. According to Mr. Shiva Shankar, YASH Pharmaceuticals Ltd General Manager, the pads can be washed for over 50 times and it is made of eco-friendly textiles, with minimum leakages. 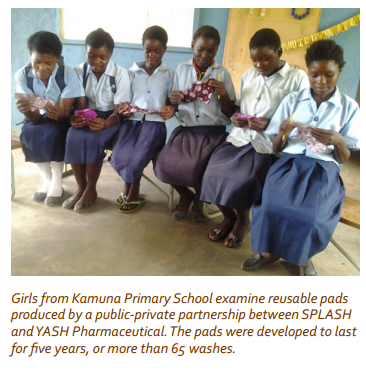 Girls from Kamuna Primary School examine reusable pads produced by a public-private partnership between SPLASH and YASH Pharmaceutical. The pads were developed to last for five years, or more than 65 washes. These efforts aim to ease the challenges that adolescent girls face during menstruation. Most of them cannot afford disposal sanitary pads. Some girls miss up to five days a month of learning time due to inadequate sanitation facilities and the lack of sanitary products at school as well as physical discomfort due to menstruation, such as cramps. Others may feel ashamed and embarrassed to go to a school that does not provide menstrual management facilities, and they may simply stop coming to school altogether. 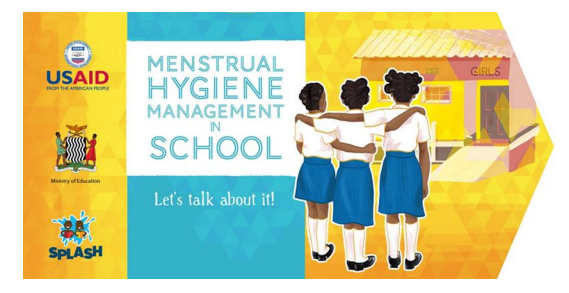 In addition to supporting sanitary pads, SPLASH has produced a number of materials on MHM, including an MHM Toolkit, an MHM brochure, and an MHM success story. SPLASH has also been working with teachers to integrate menstrual hygiene into the curriculum at school, district, and national levels. Mark your calendars! May 21 #Menstrual Hygiene Twitterchat! 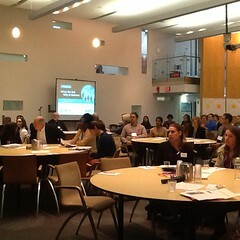 Policy advocacy around the world! If #MenstruationMatters to you, don’t miss the official #MenstrualHygiene Day Twitterchat on May 21 at 3PM GMT / 10AM EST / 7:30PM IST! Join us & help break the silence around periods! 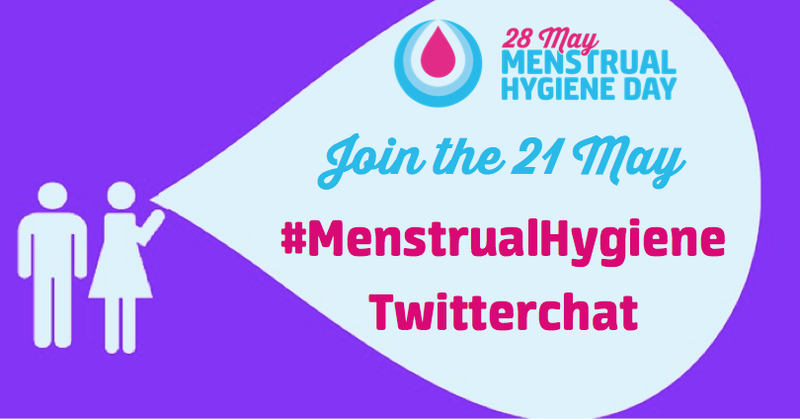 Engage in the #MenstrualHygiene Twitterchat on May 21 at 3PM GMT / 10AM EST / 7:30PM IST! 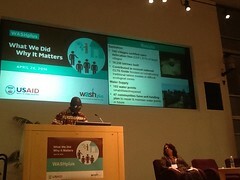 At the 2014 Menstrual Hygiene Management (MHM) Day celebrations in Zambia, YASH Pharmaceuticals partnered with the WASHplus SPLASH (Schools Promoting Learning Achievement through Sanitation and Hygiene) project, funded by USAID/Zambia, to provide 150 Menstrual Hygiene Management (MHM) kits for girls at Kabulonga Girl’s Secondary School in Lusaka. The popularity of the reusable pad-making demonstration at the event spurred YASH to undertake its own production of reusable pads. In January 2015 YASH and SPLASH signed a memorandum of understanding to codify their public-private partnership. YASH will employ local women to sew reusable pads; 10 percent of all pads produced will be distributed to SPLASH intervention schools where SPLASH provides MHM support and education with the goal of keeping more girls in school. Production is underway and the pads are being piloted in SPLASH intervention schools. Comments received from users so far indicate the pads are of high-quality fabric and very comfortable. SPLASH is seeking additional partners to purchase and distribute pads to other schools so the MHM needs of girls are taken care of and they can focus on learning.